Barking is one of the most common complaints of dog owners or their neighbors. Although barking is a normal behavior for dogs, when it is excessive or uncontrolled it becomes unacceptable to the owners or neighbors. 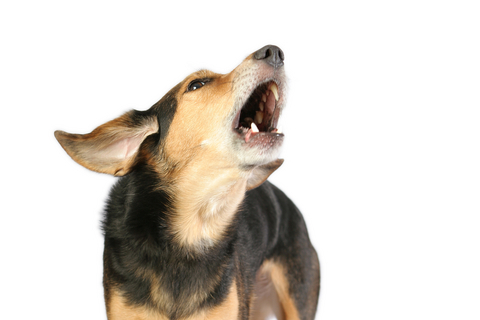 The consequences of the dog's barking (the response that the dog gets) may then aggravate the problem. For example, if barking is an attempt to get a person or animal to retreat and the person retreats, then the barking was successful and the behavior has been reinforced. If barking is response to new sights or sounds, or is intended as a greeting behavior, then the dog will become more anxious if it is not allowed to greet or if it leads to anxiety, yelling or punishment by the owners. Barking may also be associated with fear and/or anxiety, or as a form of aggression. For more information, review our detailed 'Barking in Dogs' handout and the specific handouts on these problems. "For puppies that need more enrichment or companionship, a second dog may help reduce anxiety induced barking." You can reduce barking in puppies by socializing them to as many new people, dogs, places, sights, sounds and odors as possible. If there are no negative consequences and the puppy is not rewarded for barking, it should get used to these stimuli. For puppies that need more enrichment or companionship, a second dog may help reduce anxiety induced barking. 1. The principle is to ignore barking and reward what you do want (quiet). A favored reward or clicker saved for quiet training can be most effective. 2. Do not reward any barking behavior by giving attention or by allowing the barking to be successful e.g. allowing indoors (see our handout on 'Behavior Modification – Reinforcement and Rewards'). 3. Do not punish barking as this can increase anxiety or may inadvertently serve as attention. Focus on teaching your dog that when it is quiet it will be rewarded. 4. To reduce departure anxiety, establish a predictable routine that provides sufficient enrichment but also provides times when your dog learns to spend time alone (see our complete handout on 'Training Dogs – Enrichment, Predictability and Scheduling'). 5. Dogs that bark to get attention should receive no attention until they are quiet or calm (by waiting and ignoring, training quiet or by using a head halter). 6. Consider changing your dog's environment if this is the cause of barking. For example, dogs that bark in the yard or at people passing by should be left inside the house or in a place where they cannot see people through the fence. 1. Teach your dog the quiet command. Your dog can be taught to quiet by teaching the bark command then reinforcing quiet. You can effectively stop barking by using a food or toy lure or a head halter and then reinforcing quiet behavior. A quiet command should be paired with each session where the dog can be successfully taught to quiet. Most dogs will also quiet with a settle command such as sit/watch or down-stay (see our handout on 'Training Dogs - Settle and Relaxation Training'). 2. Training should be done in areas where there are no distractions. Gradually shape the behavior so that your dog stays quiet for longer periods of time. 3. Other devices that may help stop barking and achieve quiet include devices that are activated by owners (shake can, ultrasonic trainer, noise devices) and those activated by the barking itself (e.g. bark activated spray collars). While these products may work as a deterrent in the short term, they are most successful if the owner is present to train and reinforce the dog each time it is quiet. During training, it is important not to leave your dog alone in situations where it might bark. 4. Identify the stimuli that initiate anxiety induced barking and gradually desensitize your dog (see our handout on 'Behavior Modification - Desensitization and Counterconditioning').